An intensive hair treatment to prevent hair loss, dandruff and premature graying. The secret to Indians’ lush, glossy hair – this traditional Ayurvedic recipe consists of potent herbs extracted into pure Sesame oil and Milk. A natural conditioner for lush hair growth that nourishes deeply while cooling the scalp. Also includes Indigo, Eclipta Alba and Gooseberry to promote hair growth. Anti-fungal Licorice and antibacterial Balloon Vine prevent scalp infections. The earthy scent of the oil has a calming, meditative effect that soothes frayed nerves, uplifts mood and aids in a good night's rest. Explore the entire range of Hair Oil available on Nykaa. 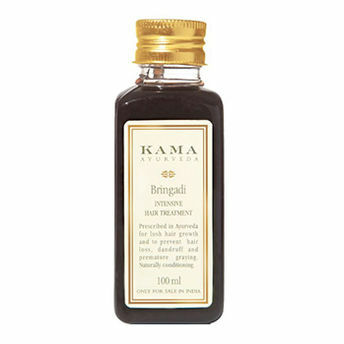 Shop more Kama Ayurveda products here.You can browse through the complete world of Kama Ayurveda Hair Oil .Alternatively, you can also find many more products from the Kama Ayurveda Bringadi Intensive Hair Treatment Oil range.